What types of air conditioning systems are used in Texas? How can I choose the right AC system for my home? How much will my new air conditioner cost? Living in Texas without great air conditioning is tough. Our summer heat demands top-quality, high-efficiency air conditioning systems to provide a comfortable indoor climate in every home and business. That’s not a new idea. Whatever your situation, when you need a new or replacement air conditioning system, you need affordable solutions that won’t ruin your budget, along with the performance needed to keep you and your family comfortable, no matter what the weather dishes out. In the major metro areas of Texas, including Dallas-Fort Worth, Houston and San Antonio, there are hundreds of residential heating and cooling contractors eager to help you. In those highly competitive markets and throughout the state, the cost and value of equipment and service depend on your choice of contractors. That’s what this website is about. Here, you’ll find the information you need on HVAC products, services and companies to help you make your best possible decisions. In modern homes, heating and cooling is typically provided by a central HVAC system that uses a system of air ducts to deliver air at the desired temperature, reliably and quietly. The central heating and cooling system, either a separate unit or part of a packaged, all-in-one system, is the heart of your home comfort equipment. Over a dozen popular brands of this equipment are available, in a wide range of prices, capacity and efficiency. Your choice will affect not only your comfort, but also your budget. In many homes in the Dallas, Houston and San Antonio area, air ducts aren’t available. Many homes use electric strip heating and noisy, ugly window air conditioners for summer cooling. Ductless split system AC technology is your best bet in these situations. Using a quiet, compact outdoor compressor and condenser unit, they supply interior cooling through unobtrusive, almost silent indoor units. Simple connections between the two can handle a single room or an entire household, with complete interior climate control. Mild Texas winters allow highly efficient, money-saving heating and cooling with one affordable system. 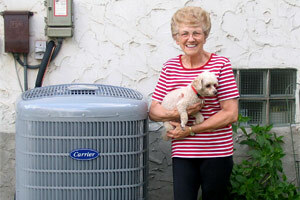 Heat pump technology uses the same concept as air conditioning, but in reverse. A simple reversing valve allows your central or ductless AC unit to heat your home as well as cool it. They work beautifully, even when outdoor temperatures go as low as 30 degrees. Electric heat supplements your heat pump on the few days when it’s colder. Heat pumps use only 1/3 of the electricity of electric heat. All major HVAC manufacturers offer air source heat pump systems. Texas homeowners can take advantage of energy stored underground on their property to handle all of their air conditioning and home heating needs. Geothermal ground source heat pumps are becoming more and more popular. They let you stop burning expensive natural gas or propane to heat your home and use three times less electricity for air conditioning. We give you all the information you need to know about this revolutionary home comfort technology and the manufacturers who build these money-saving systems. Your local AC and heating dealer can calculate how much you can save. Texas homeowners have a wide range of choices when it comes to efficient and affordable equipment. From Texas-made Daikin and Goodman systems to nationally recognized leading brands like Carrier, Lennox, Rheem, Trane, Bryant and Ruud, you’ll find a wide range of outstanding systems in all sizes and pricing. Other brands, like Ducane, American Standard, Amana and Comfortmaker are also available from local residential HVAC suppliers. When you call a Texas HVAC company for an estimate, you’ll get information and price quotes on a wide range of options. Trust your contractor to help you make the right decision. If a ductless mini-split AC system or heat pump is ideal for your home, you’ll have plenty of options. Whether you need a single zone system or a ductless system for multiple rooms, you’ll find systems from trusted manufacturers like LG, Mitsubishi, Daikin Goodman, Carrier Toshiba, Haier and Fujitsu offered by local contractors in the San Antonio, Houston and Dallas metro areas. Rely on your contractor’s advice and price quotes to help you select the right equipment for maximum home comfort and efficient, budget-friendly performance. Compare all options before making your choice. Annual inspections and tune-ups for your equipment are the keys to top performance and economy over the lifetime of your equipment. As with all mechanical systems, you may also need repair services from time to time. We’ll help you learn how to recognize problems, understand your system’s maintenance needs and know when it’s time to call a licensed, NATE-certified technician to get your system working properly again. The more you know, the more you can save on your heating and cooling costs. How Much Does a New Central AC or Heat Pump Cost? There’s no simple answer to this important question, of course. Your total cost will depend on your choices. The brand of your equipment, which model you select, capacity, and many other factors are part of every price estimate from your heating and air conditioning company. We want to help you understand those factors to help you evaluate price quotes. We’ll be adding more and more information to help you become a fully informed consumer. Let us help you save through knowledge. Most HVAC contractors in Houston, Dallas and San Antonio areas supply and install ductless air conditioners by Mitsubishi, Fujitsu, Daikin, Goodman, Carrier, LG, Haier and Lennox. The prices of these products depend on the brand, model, number of rooms cooled, efficiency rating, and contractor. As with any equipment, the total cost includes the price of the equipment and the cost of the installation. All reputable contractors will provide you a free in-home estimate on the total cost. Due to the need for heat transfer plumbing loops buried underground on your property, it costs somewhat more to install a geothermal heat pump system to heat and cool your home. However, since your ground source HVAC system uses less than half of the energy of traditional systems, you can repay that extra cost in just 3-5 years, on average. Then, you’ll enjoy saving up to 80% on your energy bills for many years to come. The exact initial cost depends on many factors, but your local Texas AC company can provide you with a customized estimate and calculate how much you can save by going geothermal. As our Texas Air Conditioning website grows, you’ll find answers to all of your questions, along with objective pages full of information to help you make an informed decision. We’ll help you learn about all brands and models, and explain the technology that makes these systems work. We’ll also guide you to trusted heating and air conditioning contractors near you. Our goal is to give you all of the information you need to help you make the best choices and save money on your heating and cooling needs. The goal of this website is simple. We want to be your central source for information on air conditioning equipment and contractors in Texas. Soon, we’ll have pages on every topic relating to residential air conditioning and experienced, trusted HVAC companies in every major population center in the state. As a one-stop source of the information you need to make informed decisions on home comfort systems, we want to give you the best, most objective information you can find anywhere. Whether you call San Antonio or the Dallas Fort Worth area home or live in the greater Houston area, you’ll find all of the air conditioning information you need right here.